Are you bored heading in to these long Winter evenings with nothing to do? 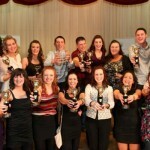 Would you like to get involved in sports, drama, debating, agriculture and many more activities? 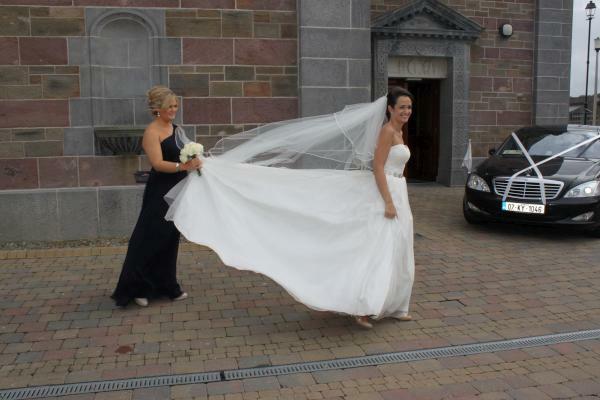 Would you like to meet new people and have a lot of craic along the way? Huge congratulations to the Millstreet Macra team of Rebecca Ambrose, Steven O’Riordan, and Katie Guerin who won the Macra Public Speaking National Championships in Killarney last weekend, and to top it off, Steven also won Best Speaker on the night. 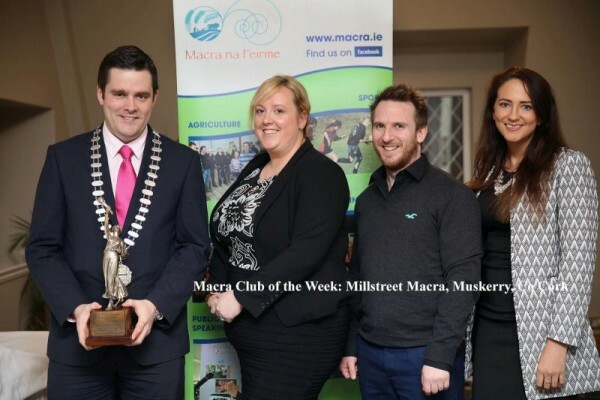 They are pictured below with Macra President Seán Finan. New Macra year kicking off. Interested? Get in touch! 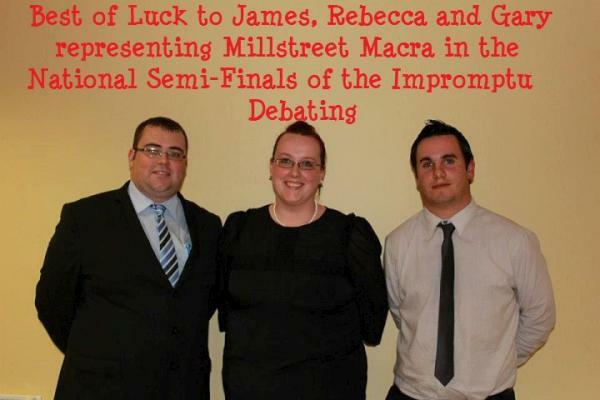 The Millstreet Macra Senior Debaters have progressed on to the quarter finals of the National rounds for the first time since the club reformed. 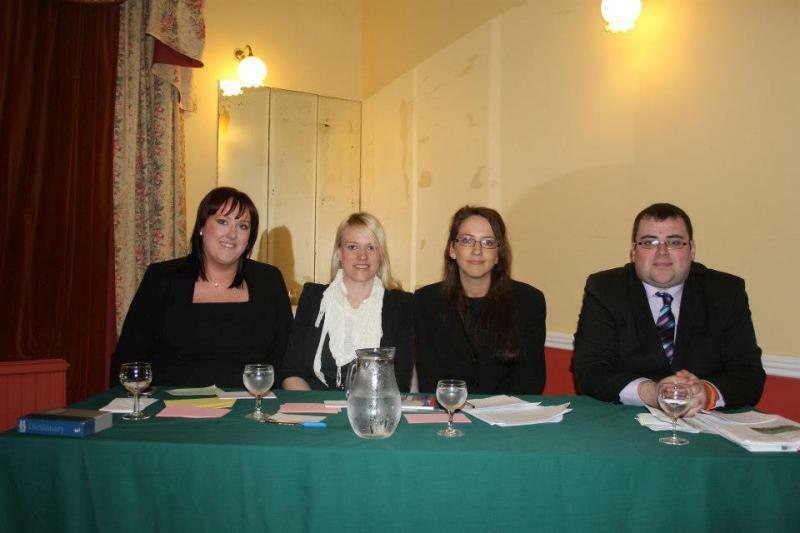 Anneka Dunne, Katie Guerin, Rebecca Ambrose and Steven O’ Riordan defeated Naas Macra, in Naas last weekend, while opposing the motion “That farmers should not retire at State Contributory Pension age”. 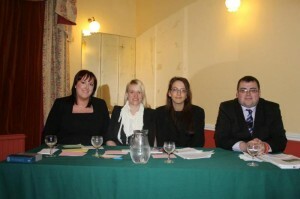 It was a very enjoyable debate, both for the team and the supporters who went up on the night. They will be taking part in the quarter final against Ramor Macra from Cavan on Saturday, 21st February. 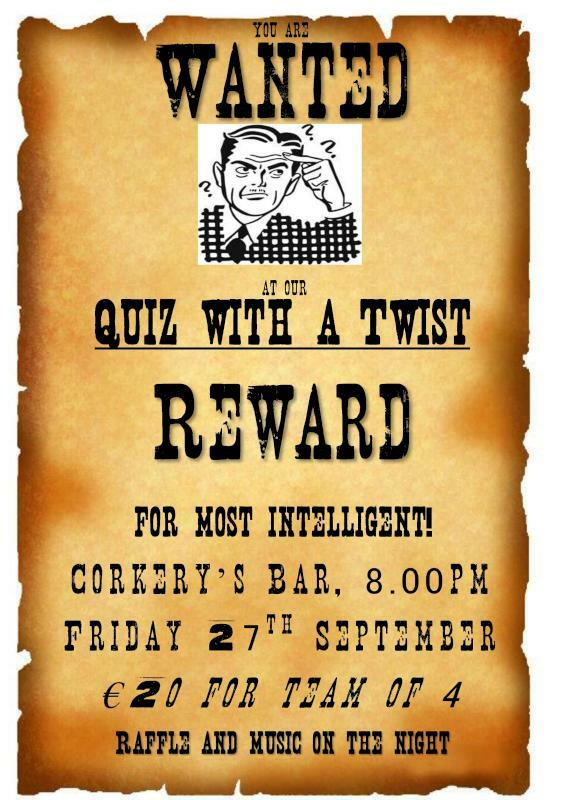 It is that time of year again, the FBD sponsored Macra na Feirme ‘Capers’ Final is upon us. 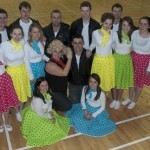 The Light entertainment competition incorporates song, dance, comedy, instrumental pieces and everything in between and is the ideal opportunity for clubs and their members to gain experience in producing and performing a top class show.It is one of the highlights of the Macra calendar and this year is shaping up to be one of the best finals yet. 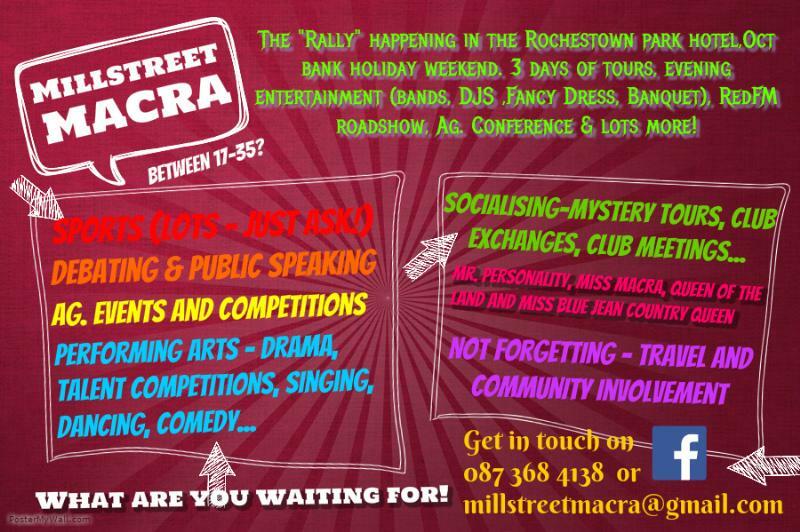 The Macra year is starting up again and we in Millstreet Macra are eager to get up and running for the year ahead. 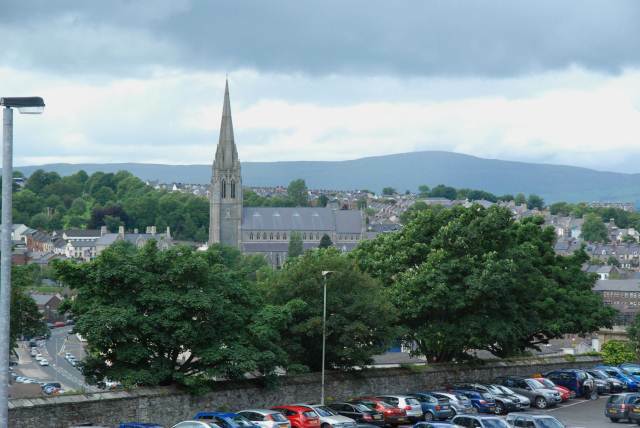 We are having a club meeting this Friday, 22nd November at 8.30 in Corkery’s Bar. The meeting will be short and sweet and will be to plan for the year ahead. We will be welcoming back the familiar faces as well as welcoming our new members. On that note, if you are interested in finding out more or, better again, joining, then why not get in contact as detailed below. We are taking part in an indoor soccer competition this weekend in Macroom if anyone would like to take part (male and female teams). We have a Christmas Party, mystery tour, sports night, competitions, club exchanges, workshops and much more in the pipeline so there has never been a better time to join!! 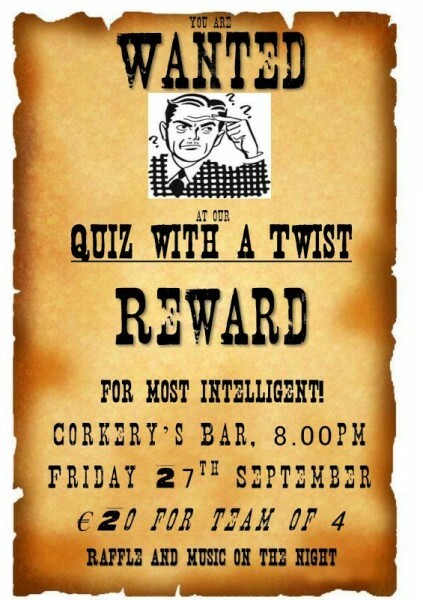 Hope to see ye Friday night. Millstreet Macra recently presented a fantastic €4,000 (the proceeds from their ‘Shave or Dye’ fundraiser) to Eileen, a representative from the Irish cancer society. The club would like to thank all of the brave souls who volunteered to have their hair shaved or dyed for this wonderful cause, everyone who was so generous in supporting the cause and the club members who helped with the event. Photo L-R: Gary McSweeney, Jerry O’ Mahony, Aisling O’ Mahony, Rebecca Enright, Eileen (Irish Cancer Society), Aoife McSweeney, Joe Kelleher, Niamh O’ Mahony, Catherine O’ Shea and Tracey Lehane. 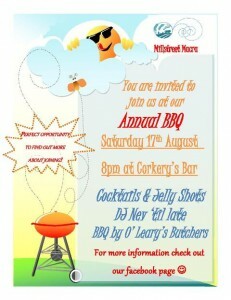 Millstreet Macra are hosting their annual BBQ on Saturday the 17th August in Corkery’s Bar. It is the fourth annual summer event and promises to be bigger and better than before. 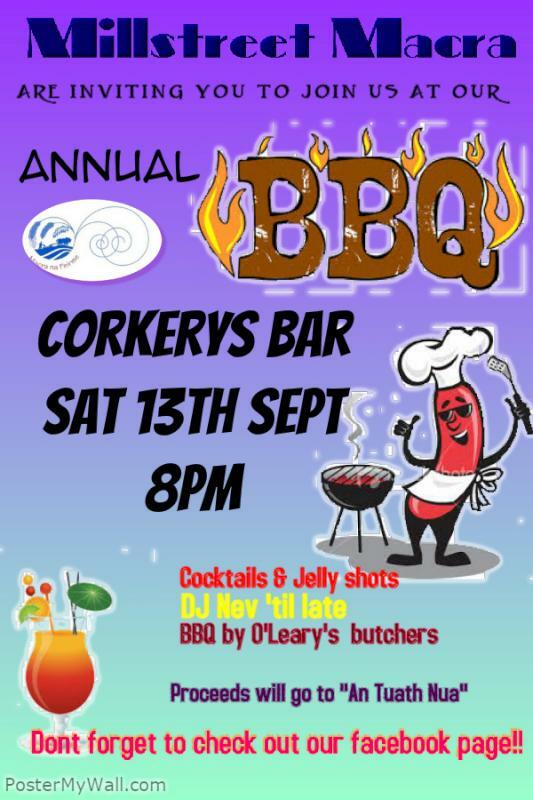 O’ Leary’s butchers will be supplying the delicious barbeque and this will be accompanied by a cocktail bar and DJ Nev until late. 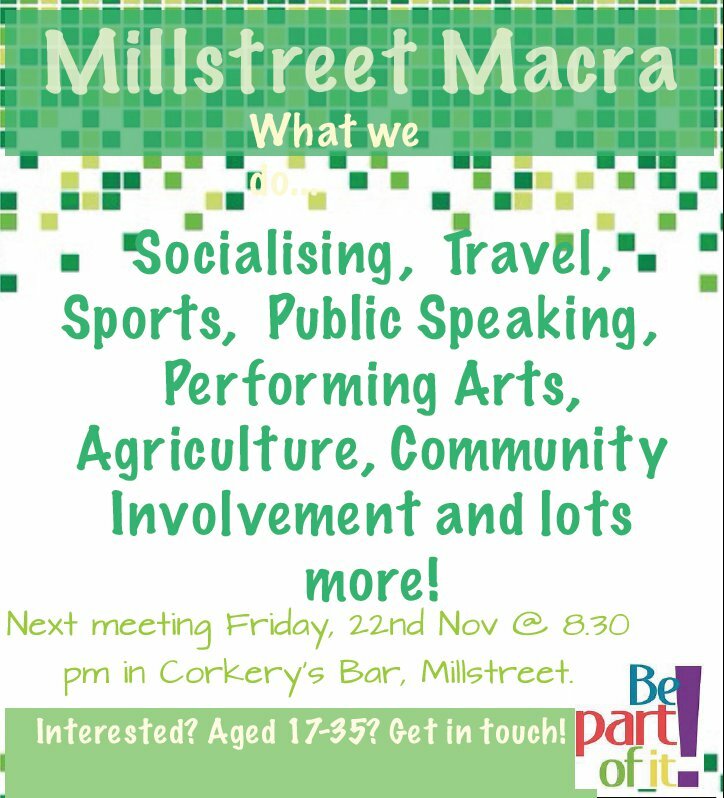 The event is our first time hosting something as part of the macra ‘Know your neighbour’ initiative and we would love everyone to come out and join in the fun! It is also a perfect opportunity to find out more about the club if you are interested in joining. 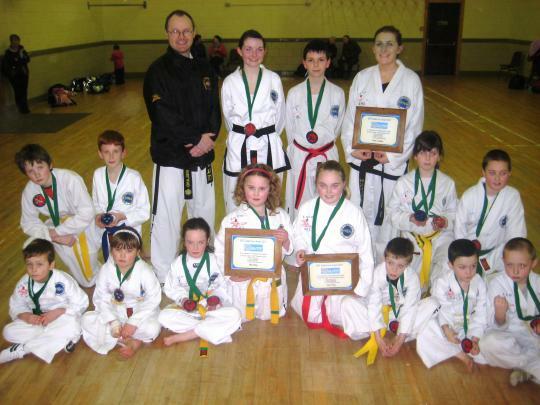 For more information see our facebook page or contact Katie at 087 3684138. 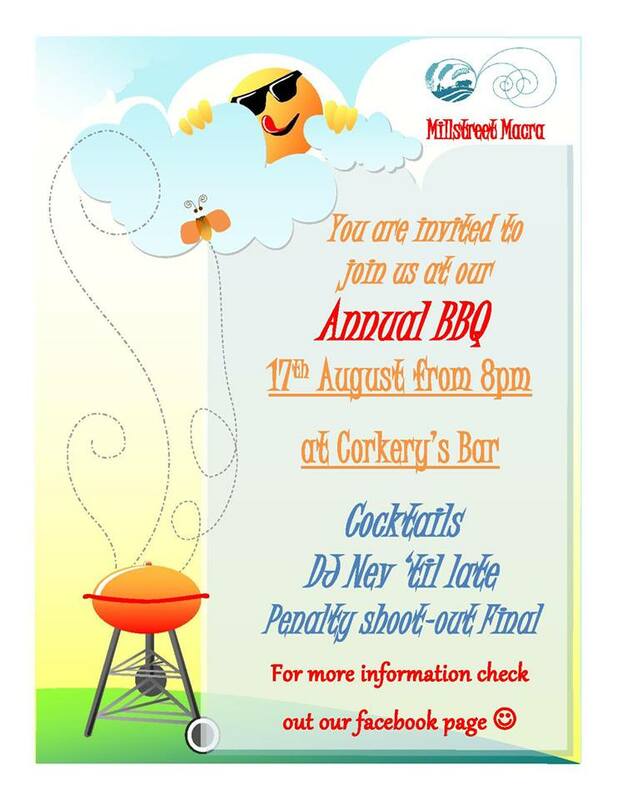 Keep the 17th August free to join us at our annual BBQ bash! Lots going on that night including the Penalty shoot-out final (more details on this to follow! 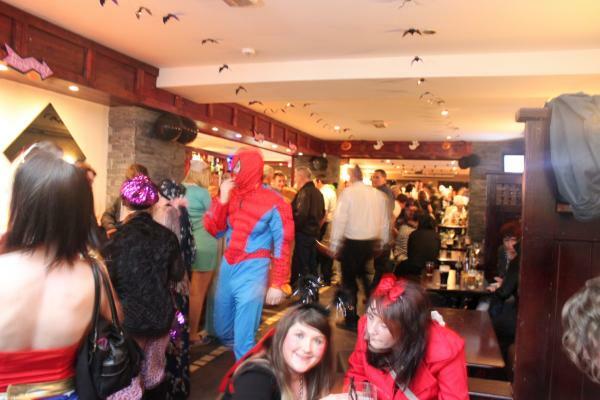 ), DJ Nev playing until the small hours and our infamous cocktails and jelly shots!! Always a brilliant night over the last few years, this year promises to be as good, if not better! Hope to see ye there. Millstreet Macra are hosting the Muskerry round of tag rugby this Sunday from midday in the Los Zarcos pitch in station road. 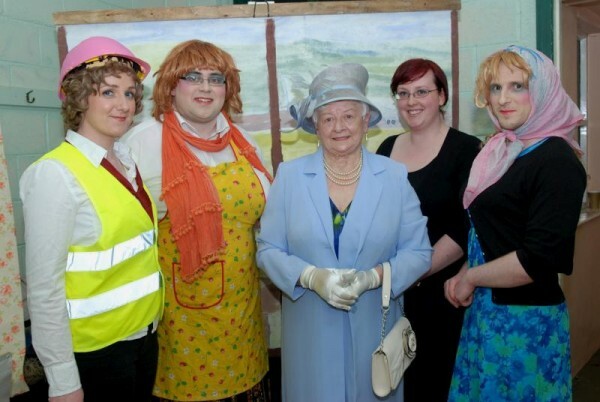 New members always welcome … so why not come have a look or just come support our team! All support would be appreciated! 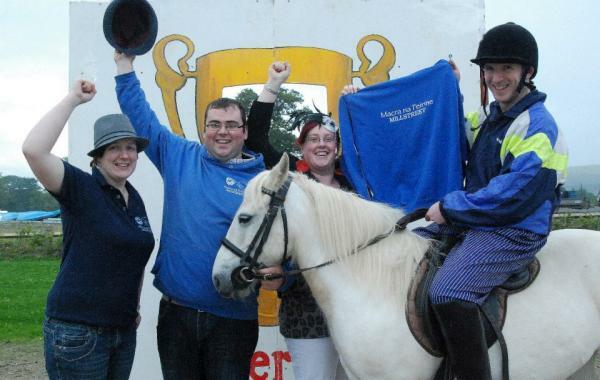 Millstreet Macra won their first National title since reforming 4 years ago. Our Question Time team of David O’ sullivan, Kieran Murphy, Dan Creedon and Mick Walsh (L-R on photo without trophies) beat off stiff competition in Castlebar at the end of February to take an outright victory and National Macra title back to Millstreet. On Friday night last (1st March). the Millstreet Macra set dancers comprised of Niamh O’ Mahony,Tracey Lehane, Maura Sheahan, Cathriona Cullinane, Laura Lynch, Ciara Hickey, Deirdre O’Mahony and Eileen O’ Sullivan won the regional round of the National Talent Contest in Ballyanly. Kieran Murphy also won Mastermind in the National Talent Contest. Both groups will be representing the region at the upcoming county final which will be taking place in Imokilly on Easter Saturday. 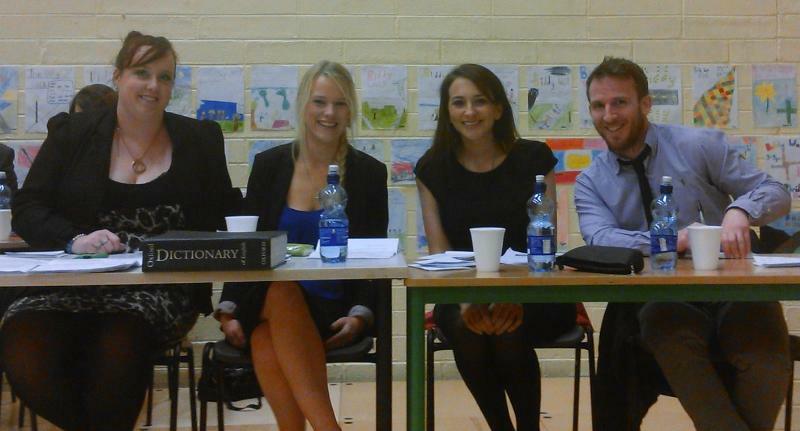 On Saturday last night our debating team consisting of Rebecca Enright, Anneka Dunne, Katie Guerin and James Kelleher (L-R in photo) beat an enthusiastic Kerry Macra team to progress to next round of the national senior debating competition. Rebecca also was awarded the ‘Best Debater’ accolade on the night of the four teams competing. 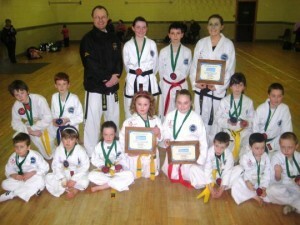 They will compete again on the 23rd of March, opposition and venue TBC. 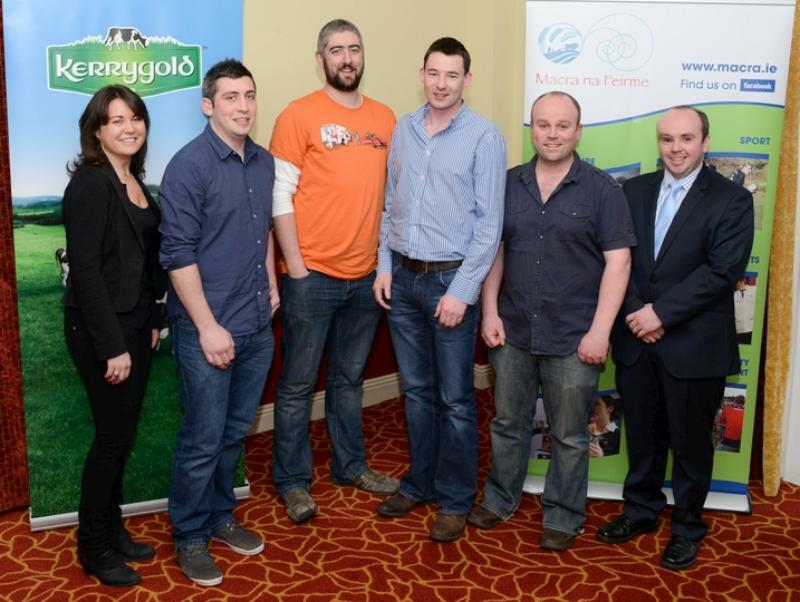 A huge congratulations to the Millstreet Macra team which won the Kerrygold Club Question Time Quiz National Final at Breaffy House Hotel in Castlebar, Co. Mayo on Saturday night. The team pictured above are Dan Creedon, Michael Walsh, David O’Sullivan and Kieran Murphy. 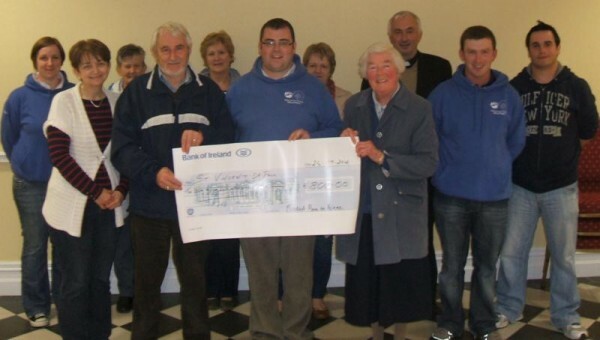 Chairperson of Millstreet Macra James Kelleher presenting the proceeds from there very successful Race Night to Members of the Local St.Vincent de Paul, Monday night last, September 24th. 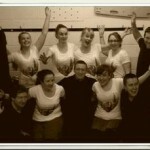 Total raised for them on the night was €800. Once again the Members of Millstreet Macra would like to thank everyone who supported the night and helped make it the success that it was! 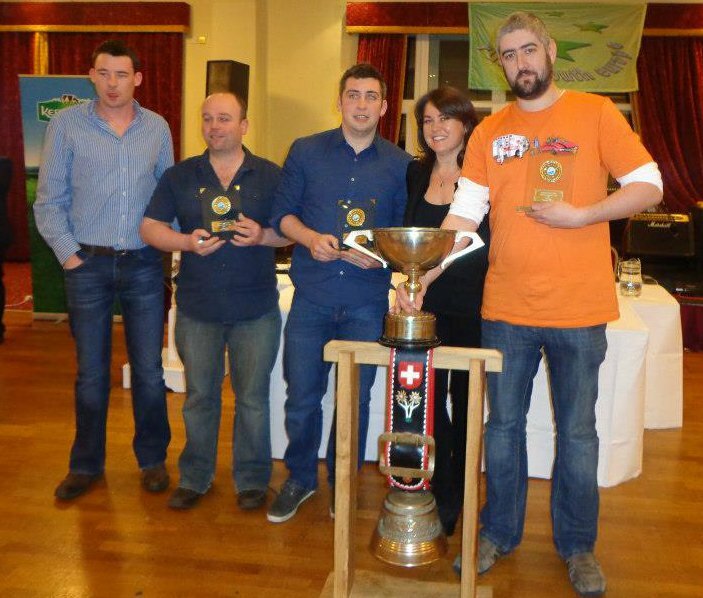 Check out all the Millstreet Macra news on their Facebook page, where you can also see photos from the Race Night! The Muskerry Macra round of Impromptu debating is taking place in the Church Meeting Rooms in Millstreet on this Friday the 14th of September at seven o’clock! 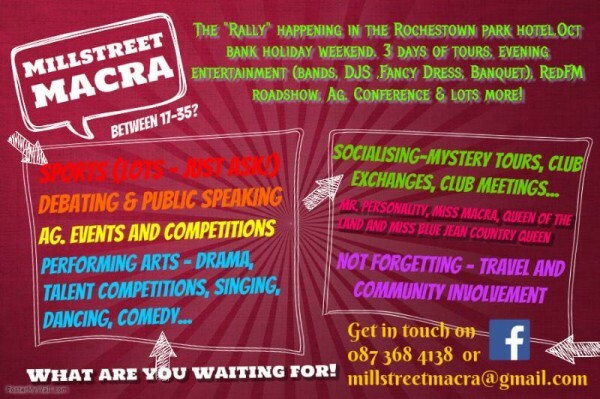 Millstreet Macra will have a team and everyone is welcome! 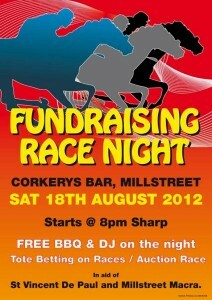 Millstreet Macra would like to thank everyone who came to our race night on Saturday last in Corkery’s. We would like to thank each and every one of our very generous sponsors without their support the night would not have been possible or the success that it was. We will host an open evening in the GAA hall this Friday evening August 24th between 7 and 10pm. 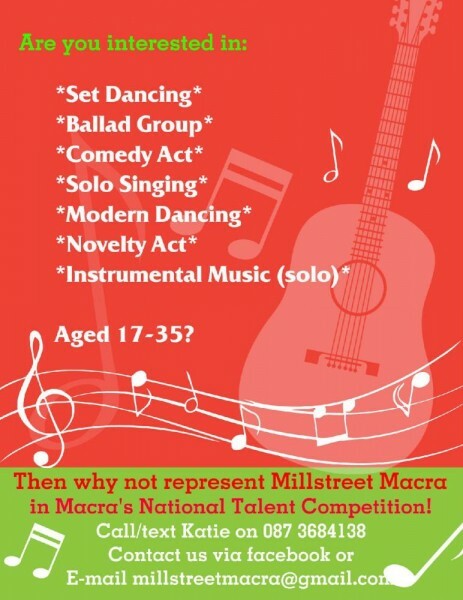 Anyone aged between 17 & 35 can join Macra, so come along meet the members and see what Macra has on offer for you. We will be on hand to answer any questions ye may have. For further information contact us @ <email> / 087-3684138. Millstreet Macra are delighted to announce that on Saturday the 18th August 2012 Millstreet Macra will be hosting a Fundraising Race Night @ Corkery’s Bar Millstreet, Co. Cork. The event will start at 8pm Sharp with a FREE BBQ provided on the night. You can place bets on all 12 races and to toast your success, we will also have DJ Nev banging out some classic disco tunes after the race night is complete. 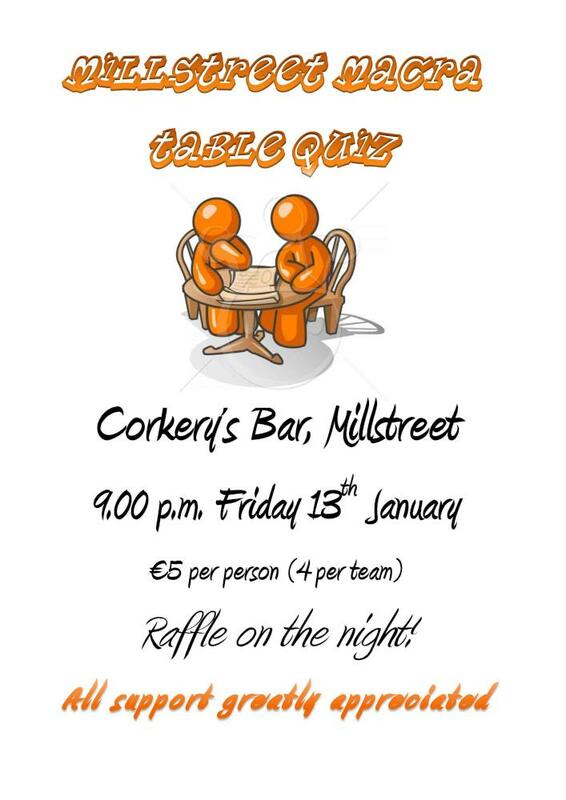 All money raised on the night will go towards helping both St Vincent De Paul & Millstreet Macra. There will also be prizes for best dressed male and female on the night. 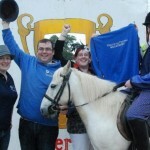 Millstreet Macra has been established now for almost 40 years. 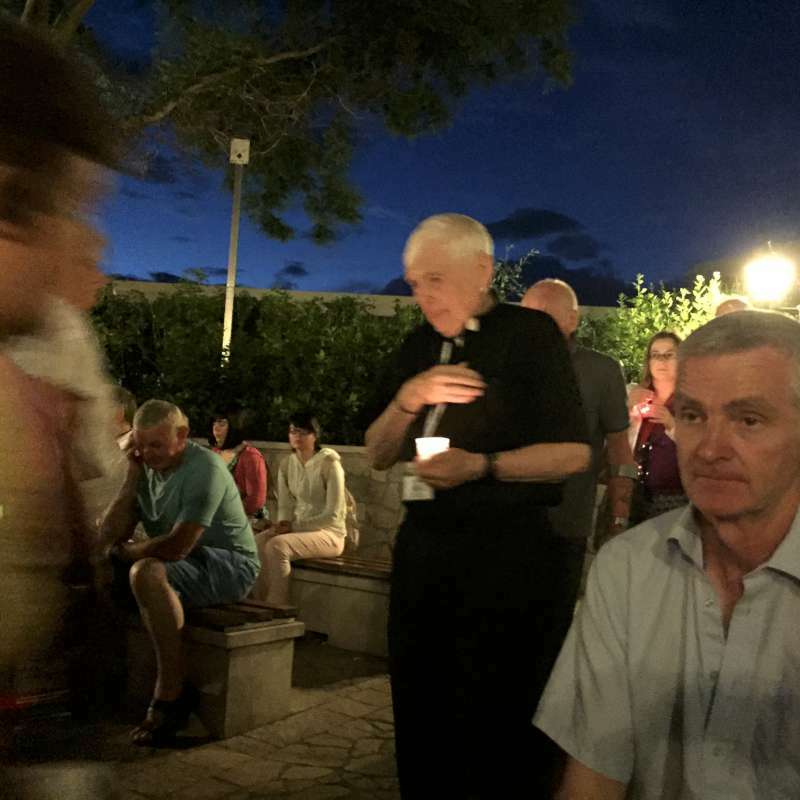 It continues to provide an outlet for young people aged between 18-35. 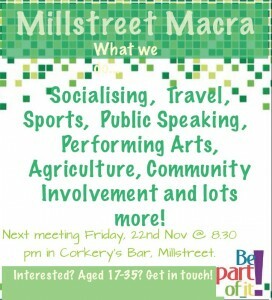 In the past few years like most voluntary organisation Millstreet Macra has been hit by the recession. 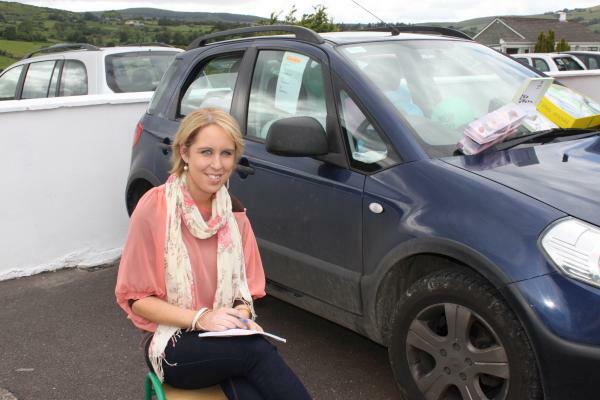 The Fundraising Race Night is seen as a way to help Millstreet Macra and St Vincent De Paul to continue the good work they do within their local community. 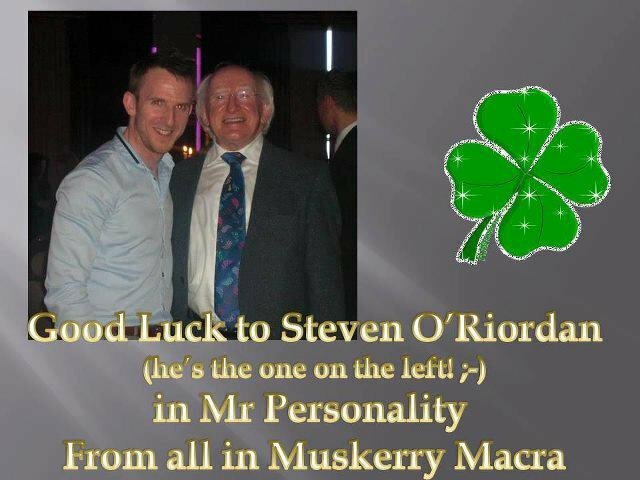 We hope that each and everyone can support Millstreet Macra in this endeavour. 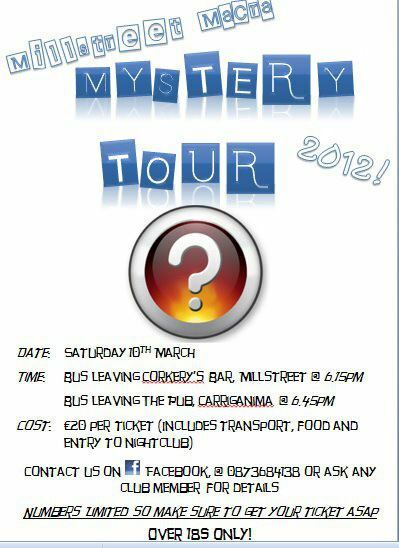 Millstreet Macra‘s Mystery Tour tickets are nearly all gone. If you want some get onto the contacts above ASAP. 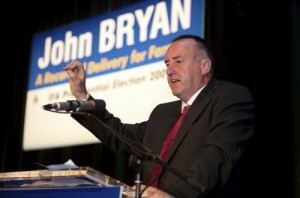 The Irish Farmers Association President John Bryan will visit Millstreet tomorrow night (Thursday 26th January), when he addresses a Duhallow IFA meeting in the Wallis Arms Hotel at 8:30pm. The meeting will discuss current farming issues, the Common Agriculture Policy 2014 negotiations, and land reclamation. All are welcome. 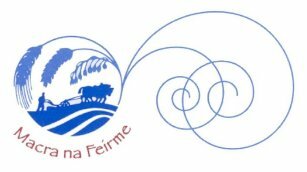 The Cork County Novice Debating final was held recently in Ballinagree, with Millstreet Macra representing the Muskerry Macra na Feirme region and Bantry Macra representing the Carbery Region. 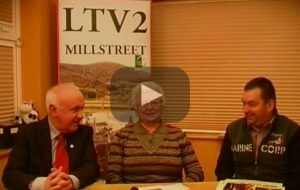 An entertaining debate was had with Millstreet emerging as overall victors on the night. 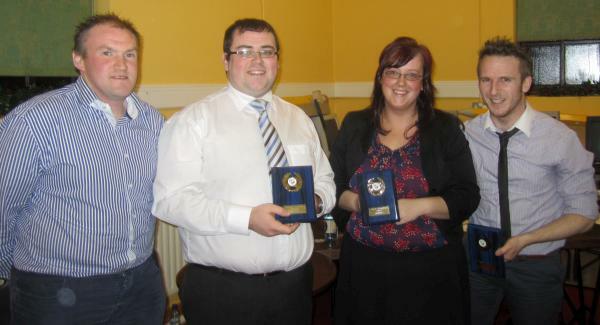 Club members Rebecca Enright and James Kelleher won the ‘Best Chairperson’ and ‘Best Speaker’ awards respectively on the night – both have won the awards twice previously in the three rounds leading up to the Final which is an impressive feat in itself. We wish the team the best of luck in the Senior Debating in the New Year. 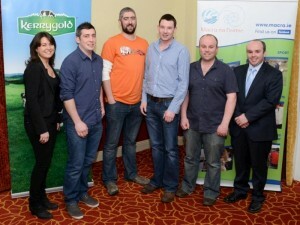 Above L-R are: Kevin Walsh (Cork County Chairperson), James Kelleher, Rebecca Enright, Steven O’ Riordan.